Zentangle® is a new and meditative art form for the non-artist and artist alike. Anyone can learn this unique, easy to learn art form. Fun, easy, mindful and fascinating! All materials provided. No previous drawing experience required! Students supply their own basic materials: a variety of pen sizes and pen colors, pencils , kneaded rubber and paper shaders. A variety of Zentangle® tiles will be provided by the instructor. Previous Basic instruction from a Certified Zentangle Teacher is required. Saturday, October 3 , 10:00 - 2:30PM $49. Zentangle in the round! Taking the ancient art form of mandalas and adding the art of Zentangle® has created the Zendala. Working on 4-1/2” circular paper tiles, students will use new and previous learned tangle patterns to create beautiful works of art. Students supply their own basic materials: a variety of pen sizes and pen colors, pencils, kneaded rubber and paper shaders. Instructor will provide drawing tiles, specialty materials and use of color mediums. Previous Basic instruction from a Certified Zentangle Teacher is required. Learn new tangle patterns and discover the beauty and simplicity of adding tea stain to your tangles! Students supply their own basic materials: a variety of pen sizes and pen colors, pencils, kneaded rubber and paper shaders. Instructor will provide drawing surfaces and specialty materials. Students supply their own basic materials: a variety of pen sizes and pen colors, pencils, kneaded rubber and paper shaders. Instructor will provide drawing tiles, specialty materials and use of color mediums. Students are encouraged to bring their own color mediums. 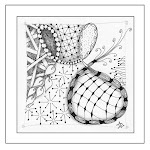 Previous Basic instruction from a Certified Zentangle Teacher is required. Set aside a day JUST FOR YOU and join us for some Zentangle relaxation and fun! Students supply their own basic materials: a variety of pen sizes and pen colors, pencils, a 9 x 12 pad of watercolor paper (cold or hot press), kneaded rubber and paper shaders. Students are encouraged to bring color mediums of their own. Instructor will provide specialty materials, drawing tiles and use of color mediums. Previous Basic instruction from a Certified Zentangle Teacher is required. #1 Friday, Sept. 25: Holding Onto Summer - Sunshine, seashells and seaside themed tangles. #2 Friday, Oct. 9: Autumn - Leaves, feathers, fall colors and more. #3 Friday, October 23: Tea Staining - Use tea and other natural ingredients to add color to tangles. #4 Friday, Nov. 13: Thanksgiving - Turkeys, pumpkins and embellished thankfulness. #5 Friday, Nov. 27: Black Friday - Tangled holiday decorations and adornments with bling. #6 Friday, Dec. 11: Christmas Tangle - Christmas cards, embellished letters and zendala gift boxes. Come one day, or as many as you like!